There’s no escaping the fact that Facebook has become a solid part of our everyday lives. However, while the official and legal age limit is 13, there’s no denying that children will find their way onto the website much earlier. While this is somewhat inevitable, as a parent, it’s up to you to take the time to be a responsible parent and help them find balance while they’re using the social networking giant. For this, you’re going to need to understand the dangers of Facebook, and the solutions that are available to you. When it comes to social media and your children, there are several dangers that you’re going to want to be aware of. Firstly, you need to be aware of who your children are interacting with. While this may be people in their school and their friends, there’s no way you know who the person is on the other end of an account. This could be a person with malicious intent and a complete stranger, and there’s no way to prove otherwise. Another key problem with Facebook is addiction, which ultimately leads to disconnection with the real world. This can also lead to physical inactivity, which can lead to obesity. If your child is getting caught up with trying to achieve likes and comments on their posts and photos, failure to do so can lead to problems like anxiety, depression or even subject them to cyberbullying. There are also a ton of situational-specific dangers that exist. It’s worth noting that Facebook doesn’t really come with parental controls that you would need to eliminate many of these problems. It’s vital that you remember that Facebook is a money-making business, not a ‘community for people interact with one another’. That is simply one of the services it provides. However, as people are still using the services and there are no parental control features available, you’re going to have to find other ways around these problems. 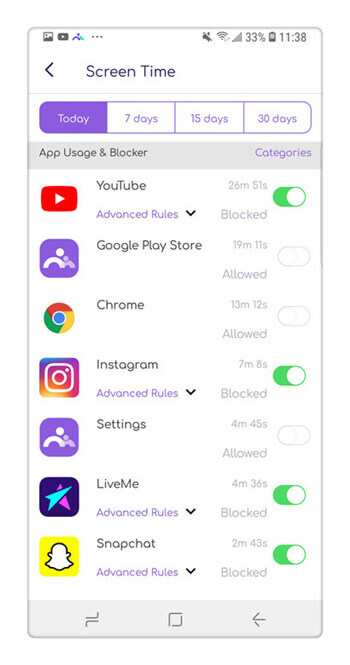 FamiSafe is a complete and feature-rich parental control app that can help you take back control of the way that your children are using Facebook, other social media websites, and in fact the of their mobile devices. Depending on your child, the US average for social media usage varies from 4-7 hours per day, which is a huge amount of time if left unchecked. Instead, using apps like FamiSafe will allow you to track how long your child is actually using their Facebook app for. With this information, you can then choose to block the application completely until you’re happy to enable it again. What’s more, you can also play around with the scheduling features. For example, if your child is at school, or studying, or supposed to be going to bed, you can block access to Facebook on a scheduling basis during these times. While many of us may not have brought anything on Facebook, there are plenty of opportunities to through games and services. As a parent, it would be nice to be able to block our children from making these purchases through our accounts. While parental controls on Facebook have a lot of features and functions, there should be a child-friendly version. For example, they shouldn’t have ads that are targeted towards children, but instead should be an ad-free experience. There are many parental controls on Facebook approaches here. Either you would have to accept the friend requests on your child’s account, or you could receive an email with a lot of information about who is becoming friends with how, so you can stay in the know and step in if needed. Facebook has a habit of picking out our faces in photographs and tagging us in them. However, a parent may want to first check that this photo is appropriate before the tag is accepted. This is an essential Facebook parental control. Whether your child is trying to change their picture, add in their address, or add potentially compromising personal information, any profile changes should be authorised by parental controls on Facebook. 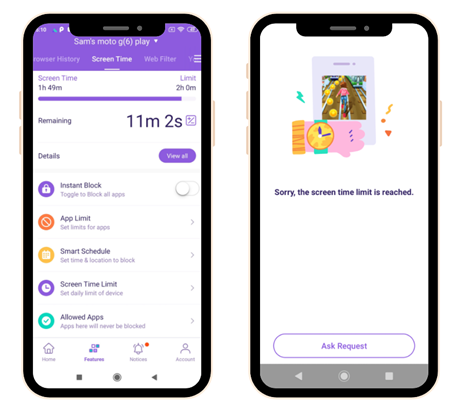 We would love to see Facebook parental controls automatically offer time restrictions on their app, so parents could set how long they want their children to access their accounts and then block access. Fortunately, FamiSafe can help us achieve this in the meantime. This would be an awesome feature where you can create a network of parents that you know and relate to children, and this can help you all work together to protect the safety of your children and online presence. Some children are not going to want to accept their parent as a friend of Facebook for whatever reason, which can end up with you being locked out. 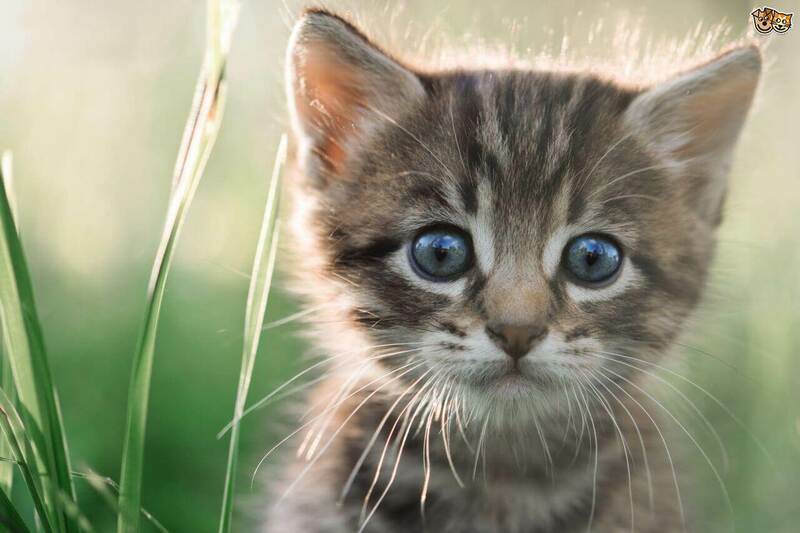 However, parents on Facebook should have an option that allows you to view the account without having to be friends. Privacy settings are so important on a child’s account to help protect their content and their identity. While Facebook is starting to make improvements to this setting, easy-to-understand control settings is crucial. This is ideal for parents on Facebook. When you sign up for Facebook, you’re asking several times to add in your mobile number, which then links to your text message functions. Unfortunately, this can sky-rocket text message bills, so there should be limits involved. 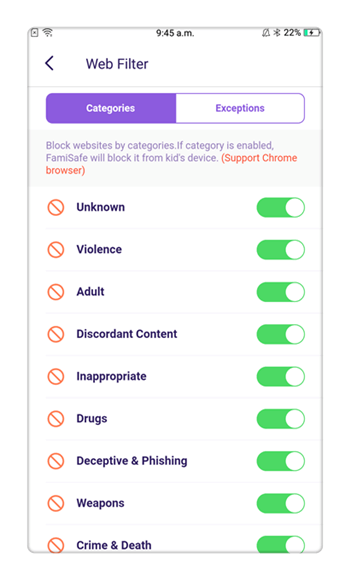 You can toggle on and off certain categories of content you want to block from your child’s device while they are browsing the internet. You can also block individual websites by typing in the URL into the app. 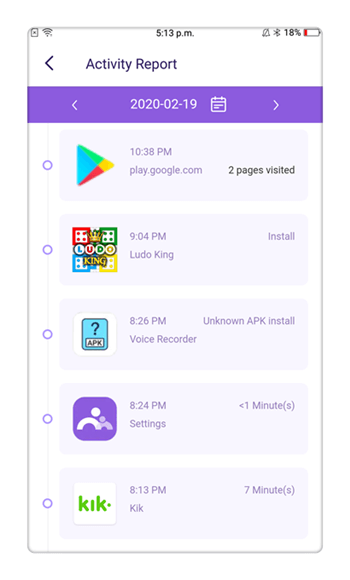 In addition to tracking app usage, you can track the entire device usage. This details how long your child is using their device for, what times they are using their device, and which apps they are using the most. You can then block access to the device completely or set up appropriate usage times using the scheduling feature. Unlike other parental control apps, you can easily make the changes and feature settings on your own device for them to be instantly applied to your child’s device. In short, it doesn’t matter if you’re at home and your child is at school, you can still control their device. You can easily see the real-time GPS location of your child at any time. 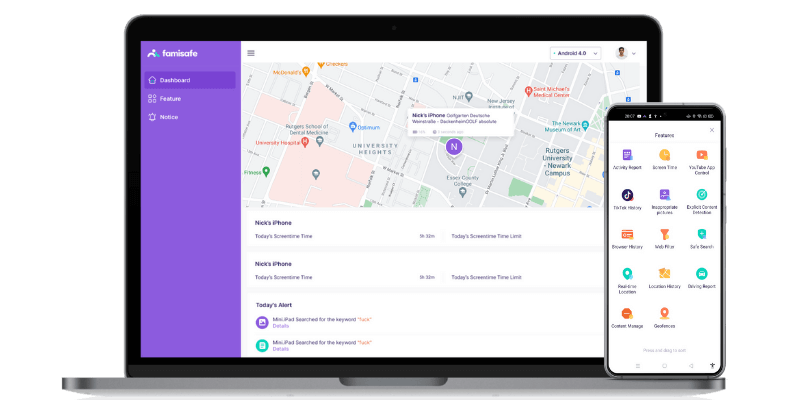 You can even see your child’s location history of where they’ve been and set up geo-fences, so you’ll receive a notification if your child breaches the geo-fencing rule. When it comes to parents on Facebook, it’s rather disappointing to see that they haven’t’ got as many parental control features as many parents would like. Luckily, apps like FamiSafe are here to help. FamiSafe is available on both Android and iOS devices, and can be downloaded for free today. There’s even a three-day free trial so you can see for yourself what this app can do.